Rasmalai, a traditional scrumptious Indian Dessert is easy to make sweet recipe. Rasmalai is popular during festivals and occasions. You can prepare Rasmalai ahead and store in your fridge for birthday parties, kitty parties, buffets and even on office parties. I have always been crazy about rasgulla, rasmalai, cham-cham. You name a Bengali sweet and I am all for it. Why Bengali sweets, any sweet and you will find me plunging right into it. Except maybe shrikhand, I cannot stand my curds sweetened. Do you like sweets too? What are your favourite sweets? Do mention in the comments, I will love to hear from you. 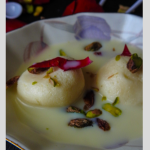 Coming to Rasmalai this is my second sweet for Holi Festival. The first being Phirni, that I have made from Plant-Based milk check it out here. Ras malai, Rossomalai is an East Indian Dessert. Rasmalai is made from what is called chenna or cottage cheese that is freshly made, (the chenna may be white or coloured ) then cooked in sugar syrup. These are called rasgulla. 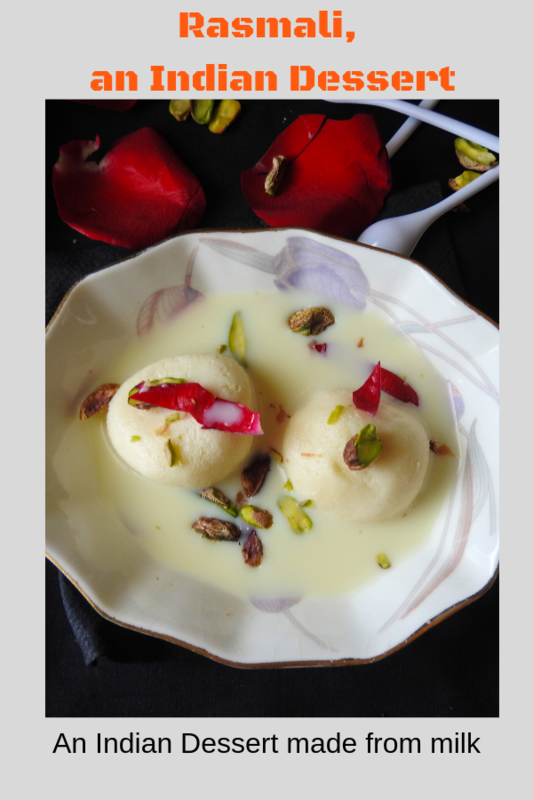 But then this rasgulla is dipped in warm thickened milk and then you have your Rasmalai ready. The main ingredients for Rasmalai are easily available in an Indian Pantry they are paneer/cottage cheese, flour, milk, cardamom, dry fruits, saffron. If you are looking for a sugar-free version then you can replace sugar with sugar-free or stevia. Like I have already said you will need to make the rasmalai in 2 parts. Ras and malai. 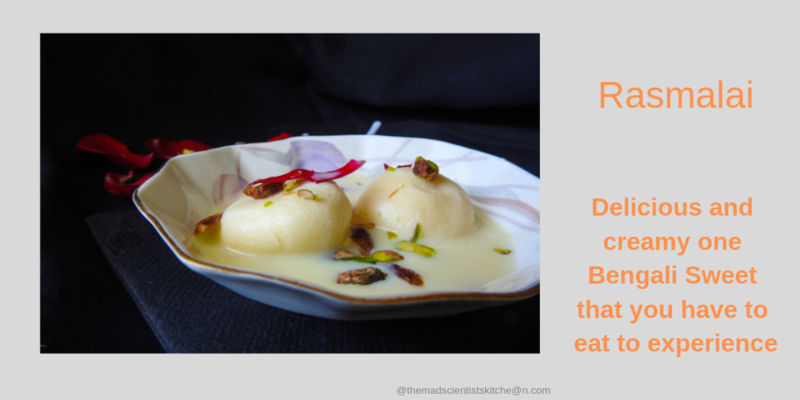 I prefer to make the malai first as this way I can always use readymade rasgulla or store brought rasgullas to dip in the ras in case I do not have time to make the rasgullas. Also, the rasgulla just disappear with me around so it is safer this way. You can make the rasgullas first if you prefer. I have used readymade rasgulla today but check out the method of making Rasagulla out here. 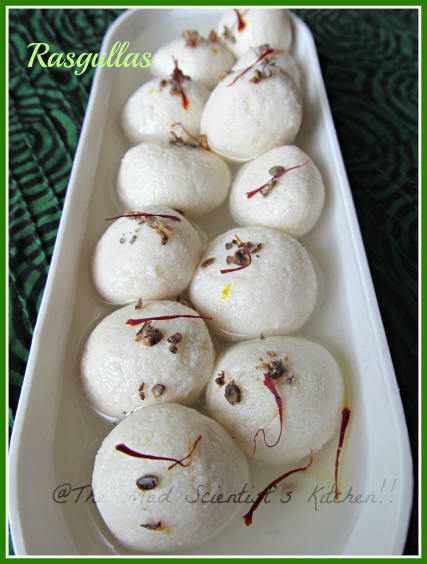 A traditional Indian Dessert made by soaking cottage cheese balls in thickened milk. Transfer the milk in a thick bottomed pan. The pressure cooker is the best. Warm the milk and remove about say about a ¼ cup of milk. Soak a few strands of saffron in the ¼ cup milk and set aside. Let the milk come to a boil. I prefer to do this on low flame and I use a ceramic plate called basundi stone (see the picture). This prevents the milk from burning. After about 10 minutes your milk will be a bit reduced now add the sugar, stir and continue boiling. After 20-25 minutes the milk will have thickened well. Add the saffron milk and crushed cardamom mix. Bring to a boil and switch off the flame. In case you are using readymade rasgulla like me then transfer them to a bowl. Take 1 ball and gently squeeze it between your palms. Transfer to the warm milk. Your rasmalai is ready, you can eat it now. In fact, I love the ras malai at this stage too. The milk has not seeped in the rasgulla but still, it is delicious. But be a good girl Archana and transfer to a container cover it and chill it in the refrigerator overnight or for 5-6 hours. Preferably when you are in office they will rest well. Garnish with chopped pistachios, rose petals and few saffron strands before serving. 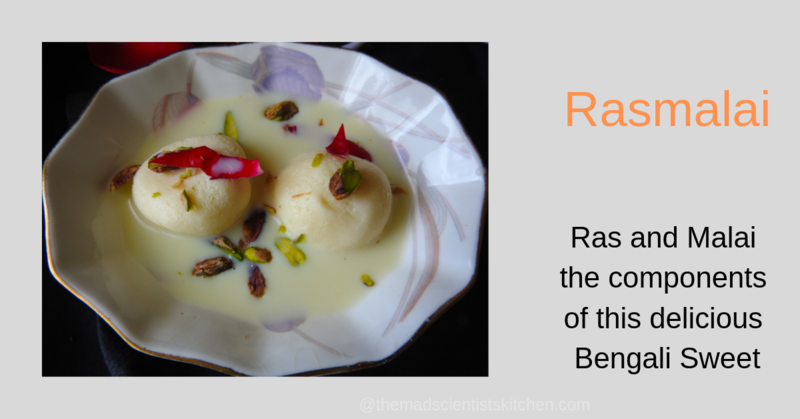 Make the rasmalai in advance, in fact, one day in advance is the best so the flavours are well absorbed and the rasgulla soaks well. Add the crushed cardamom in the end. The aroma is amazing. Use cardamom pods for powdering the readymade or the essences do not do any justice. Oh wow.. perfectly made rasmalais.. they look so inviting. This is something that I still have to try my hand at.. Will do that soon now that I have a nice recipe here..
Wow, Thanks Shobha. That is one amazing compliment. Please tag once you do. I love rasmalai and rasgullas. I’m not a big fan of shrikhand as I prefer my yogurt not to be sweet. Your rasmalai is super tempting, each one shaped perfectly. Mayuri, I thought I was one of the kind because I do not like sugar and curds. Thanks. I do not feel so odd now. One of my favorite dessert. Love your detail step by step instructions. At times even I make it with ready made Rasgulla, comes in handy.